This vegan spin on shakshuka is made with spinach and lemony pan-fried tofu (in place of eggs!) in a smoky tomato and red pepper sauce. It’s perfect for breakfast or dinner, easy to make, and absolutely delicious scooped up on crusty pita wedges. For a long time I’ve been both intrigued and grossed out by the idea of shakshuka. Grossed out because: eggs. They were always at the top of my least favorite foods list. But even if I could never get past the taste and the smell of eggs, I’ve got to admit, they cook up in some pretty cool ways. The eggs in shakshuka get poached right in the sauce, which is pretty cool indeed. That’s one of the reasons the dish always sounded so intriguing to me. That and the sauce itself. 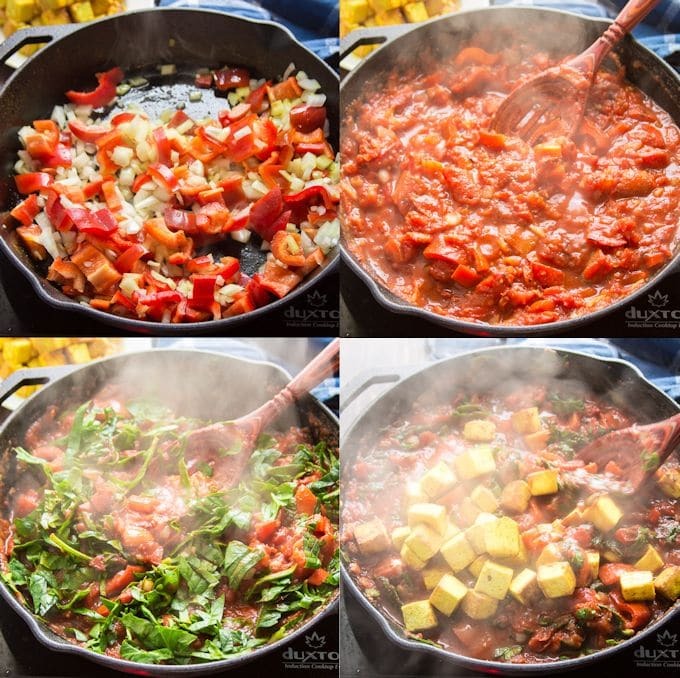 I got my hands on a jar of shakshuka sauce a couple of years ago (the sauce was vegan — yay!) and loved it. I created by own version and started cooking all kinds of things in it. Tofu and greens were my favorite! Tofu has an eggy texture that works great in dishes like tofu scramble and even vegan quiche. And I love greens in just about anything! Maybe tofu and greens don’t do that cool congealing as they cook in the sauce thing like eggs, but you can’t win ’em all. They make up for their lack of poachability in deliciousness. 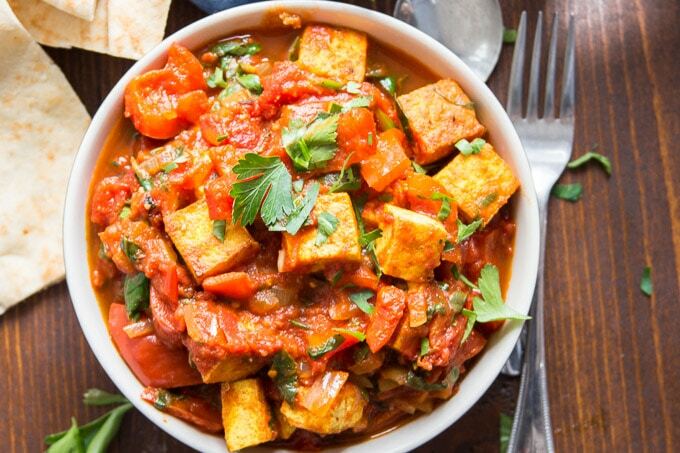 This dish starts with tofu. 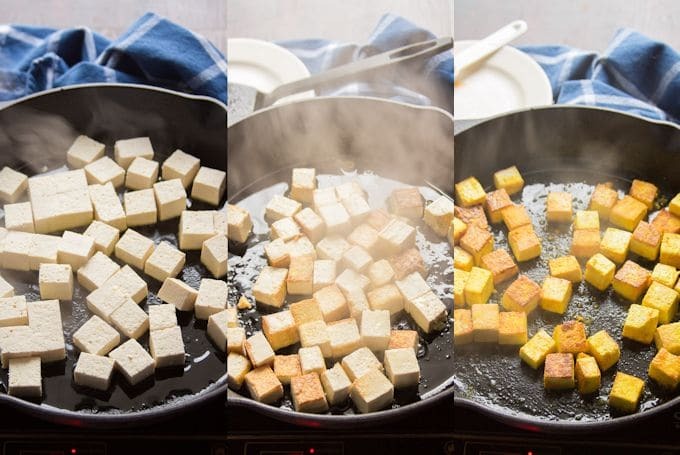 Pan-fry your tofu in a skillet according to this method. Once it’s browned and crispy, add a bit of lemon juice, turmeric (purely for color — at least it makes the dish look more eggy), salt and pepper. If you want your tofu to actually taste eggy, use kala namak instead of regular salt. 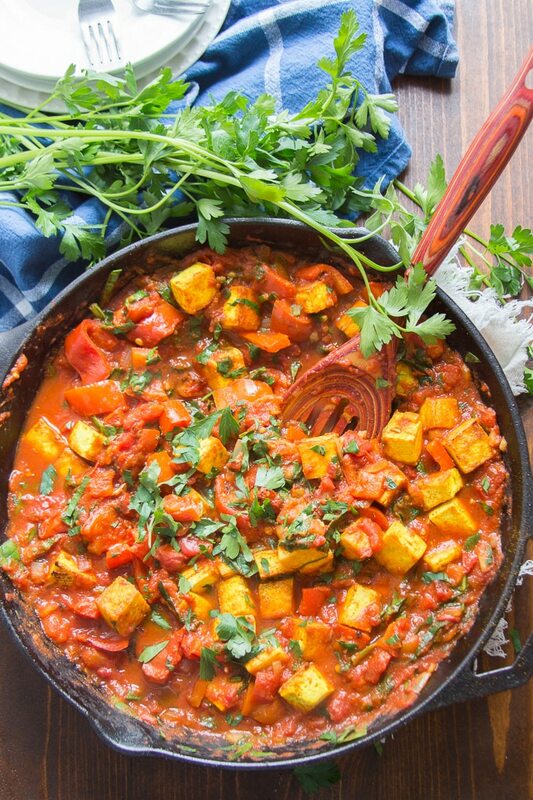 Take the tofu out of the skillet and add some onion and bell peppers. Sauté them until they soften up a bit. Next, add tomatoes and spices. 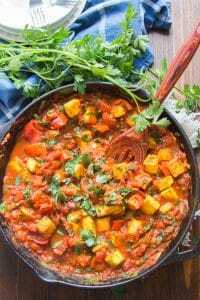 Let everything simmer until the veggies are fully cooked and the flavors have mellowed. Spinach goes in towards the end, and you’ll let it simmer for just a few minutes, to wilt, before adding the tofu back in. 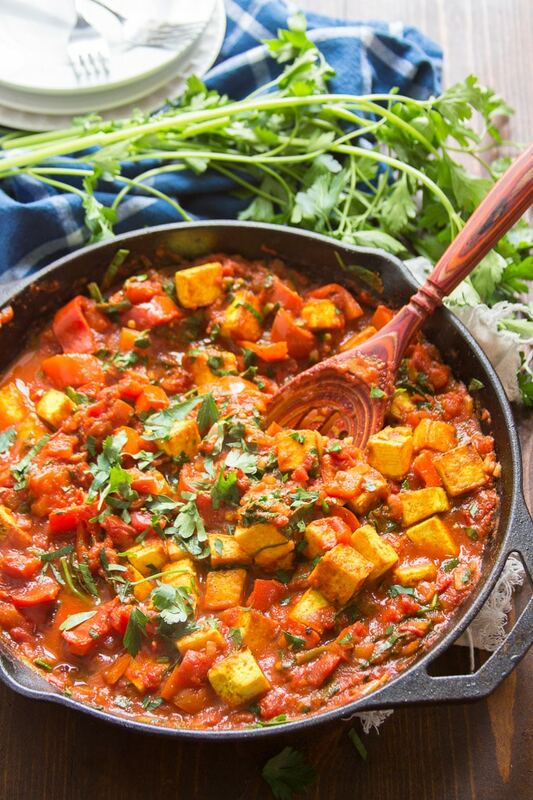 Top your vegan shakshuka with a generous sprinkling of parsley and cilantro before serving. If you actually want your tofu to taste eggy, try sprinkling it with kala namak (a.k.a. “black salt”) instead of regular salt. Kala namak has a high sulfur content, so it makes things taste like eggs. It’s available at most Indian grocery stores, or on Amazon. Feel free to substitute another variety of greens. I’ve made it with chard and it was equally delicious, though the chard does need a few extra minutes of cook time compared to spinach. I highly recommend serving your shakshuka with some crusty bread or pita wedges for scooping up the sauce. Is this dish gluten-free? It certainly is! This vegan spin on shakshuka is made with spinach and lemony pan-fried tofu (in place of eggs!) in a smoky tomato and red pepper sauce. It's perfect for breakfast or dinner, and absolutely delicious scooped up on crusty pita wedges. Coat the bottom of a large skillet with 1 tablespoon of oil and place it over medium heat. When the oil is hot, add the tofu in an even layer. Cook the tofu for about 10 minutes, flipping once or twice to achieve browning on multiple sides. Sprinkle the lemon juice, turmeric, and 1/2 teaspoon of salt over the tofu. Flip it a few times to distribute the seasonings and cook for about 30 seconds more, until most of the lemon juice has dried up. Add the remaining tablespoon of oil to the skillet and give it a minute to heat up. When the oil is hot, add the onion and bell peppers. Sauté them for about 5 minutes, until they begin to soften. Add the garlic, cumin, paprika, and cayenne pepper to the skillet. Sauté everything for about 1 minute more, until the garlic becomes very fragrant. Stir in the crushed tomatoes and fire roasted tomatoes. Raise the heat and bring the mixture to a boil. Lower the heat and allow the sauce to simmer, uncovered, for about 10 minutes, until the peppers are soft and the sauce has thickened a bit. You can add a splash of water if it gets too thick while simmering. Stir in the spinach and allow the mixture to simmer for about 5 minutes more, until the spinach has fully wilted. 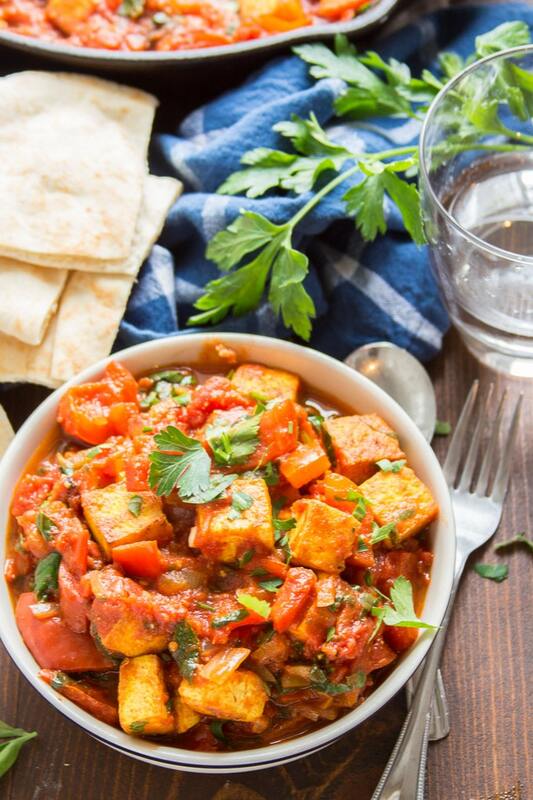 Stir in the tofu and allow everything to simmer for about 1 minute more — just enough time for the tofu to heat back up and absorb a bit of the sauce. Remove the skillet from the heat and season the mixture with salt and pepper to taste. 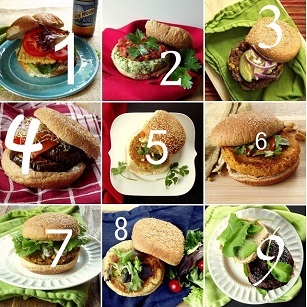 Top with parsley and cilantro. *For extra eggy flavor, season your tofu with kala namak instead of regular table salt. I have been wanting to make a Shakshuka for a while now, so I’m really excited to try this vegan version! I wasn’t sure how best to replace the eggs, but tofu is a great idea. Thanks Teresa! I hope you enjoy it! Very welcome!! I’m so glad you’re enjoying them! I’m also thinking of using Sliken tofu to give it that soft creamy feel that eggs would have. Asian dishes such as Ma Po tofu uses Silken tofu for a similar stew like type dish. I wonder if using a silken tofu might make it more egg-like? Extra firm, of course, or it would just pretty much disintegrate. Or maybe smash it a bit and add a little slurry of corn starch and nooch that has the kala namak in it? 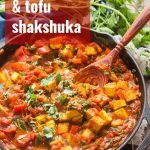 I’ve never made shakshuka, so I’m only guessing here…but that recipe sounds positively WONDERFUL!!! Definitely saving for later! I bet this would be great with injera as well! Hey! I finally got to try this, and I loved it! I didn’t make any major changes, but I did add about 2 tsp of brown sugar to the sauce towards the end of the simmer to cut the acidity of the tomatoes and add a little depth to the flavor. I served it with some jasmine rice that I had cooked in coconut milk and it was lovely. My husband doesn’t even like peppers or tomatoes very much and he had 3 servings! Thanks again! That’s awesome! And it sounds like a delicious meal! Thanks so much Teresa! I made this for dinner tonight, and it’s quite good! The black salt really does give it an eggy flavor, which I enjoyed. I cut down on the cayenne a bit, since I’m sensitive to the heat, and skipped the black pepper altogether as I dislike it. To me it was still spicy enough to taste good but not too hot. We ate it with homemade bread. Thanks for the delicious recipe–I’m sure I’ll make it again sometime! Sounds like a delicious meal! I’m glad you enjoyed it!